This very comfortable 3 bedroom detached villa sleeps up to 6 people. Situated in a quiet cul de sac the villa has a sunny south/west aspect. 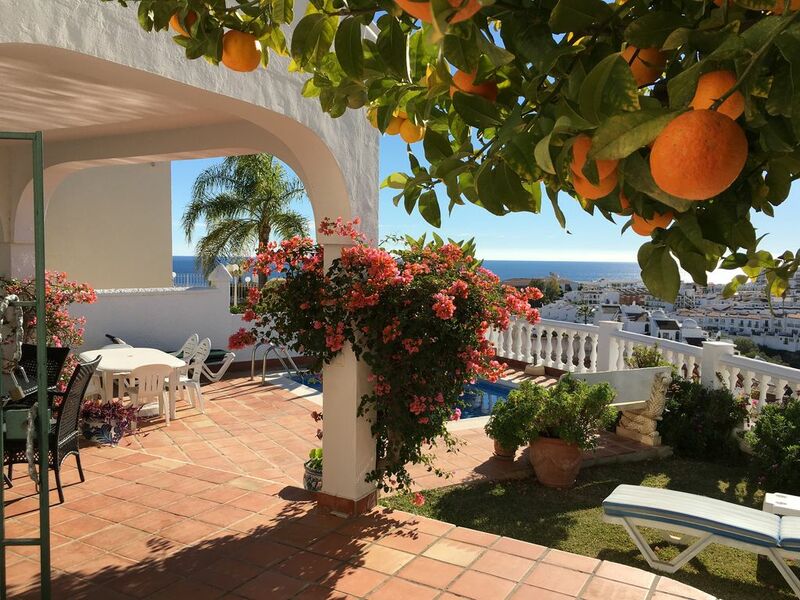 It has a private garden with patio, private swimming pool and terrace with stunning views overlooking the small town of Nerja; where there is an abundance of shops, restaurants and bars. Nerja is 45 minutes by motorway from Malaga airport. The villa is 10 minutes walk down to Burriana beach. It can be accessed by road leading from/to the beach or by main road leading out of Nerja towards Maro. Bathroom 1 (1st floor) with Shower Bathroom 2 (ground floor) with wc, small bath, and walk-in shower cubicle. Living room/diner with dining table and chairs, sofa and chairs TV, Wi-fi. Patio doors leading to large covered patio with private garden and private swimming pool. Compact kitchen with oven, hob, microwave, fridge/freezer, coffee maker and all amenities. Notes on accommodation: The entrance hall leads upstairs to bedrooms 1, 2 and bathroom, and downstairs to kitchen, living/dining room, bedroom 3 and bathroom 2. Pets are not allowed. Outside: Large covered patio with private garden and small swimming pool. Access steps down to basement housing tumble drier, sunloungers, water heaters and pump for swimming pool. Parking available on hardstand to front of house. Cleaning / Towels / Linen / Maid service: Bath Towels, Sun Lounger Towles provided. We request clients do not take any towels to the beach. Beach Towels to be provided by client. A change of linen and towels are provided in property. We request clients to wash linen and towels if required. Beautiful, well equipped house in a great location. Glad you enjoyed your holiday in Casa Cover and thanks for a great review. Second stay in this property which says it all! We had an amazing week in Casa Cover. The location is great - a 10 min walk down the steps to the beach and in a really really quiet location. The views are spectacular and the villa has everything you need, well stocked, clean and modern. Dealing with Nigel and Alison was so easy. They were quick to reply to any questions and even while we were over in Nerja they were always available to help. Would absolutely recommend Casa Cover to anyone looking to visit Nerja. It has everything you need and is a great place to stay to take in the views and as a base to get to all the local attractions. We had a wonderful stay in this lovely Villa. It was beautifully equipped and has a stunning view towards the Mediteranean Sea. We found that the kitchen was now fully equipped ( see previous review). We spent many sunny days on the lovely terrace and found the lounge a relaxing retreat in the evenings. We would strongly recommend this as an ideal base for a holiday in Nerja. The lovely town of Nerja is well worth exploring with large selection of shops, bars, restaurants. Approximately 20 minutes walk to centre of Town and Balcon De Europe. Tennis, bowling, swimming, racket ball, bowles, all within 1 mile of villa. Golf: there is a choice of courses within 30 min drive. Skiing available in Sierra Nevada in winter approx 1.5 hrs drive. Malaga airport is 45 minutes. Own transport ie car hire is recommended but not essential. Booking Notes: A non-refundable deposit of 25% is payable upon booking, and balance payable 4 weeks before arrival date. A further holding deposit of £100 is payable with balance, which is refunded upon return of receipt of keys. Changeover Day: Preferences are given to Saturday arrival/departure days. Accommodation is available from 4.00pm on date of arrival, and needs to be vacated by 10.00am on the day of departure.